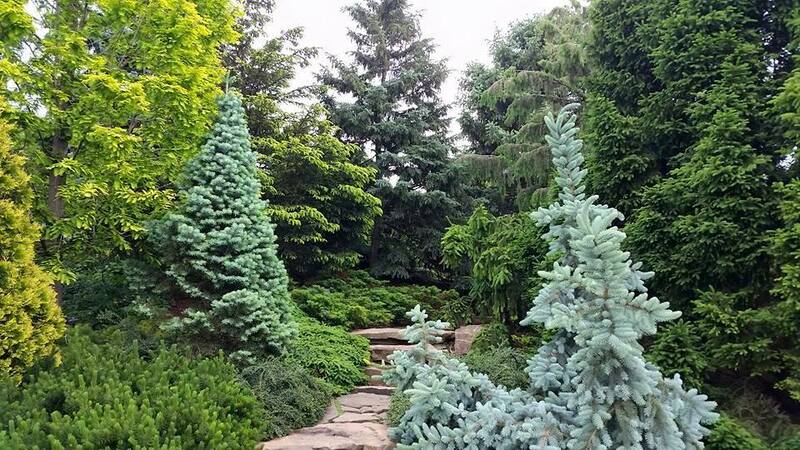 Early summer in the Dwarf Conifer Garden is all about the new growth. Everything is bursting forth with fresh new growth in vivid shades of green, chartreuse, yellow…and blue! Layers of color draw you into hidden paths throughout the Dwarf Conifer Garden. Many of the trees feature entirely unexpected colors. For most of the year, Spring Ghost blue spruce (Picea pungens ‘Spring Ghost’) looks like your average Colorado spruce. From early spring through midsummer, however, the tips of every branch shine with the palest yellow—nearly white—new growth. 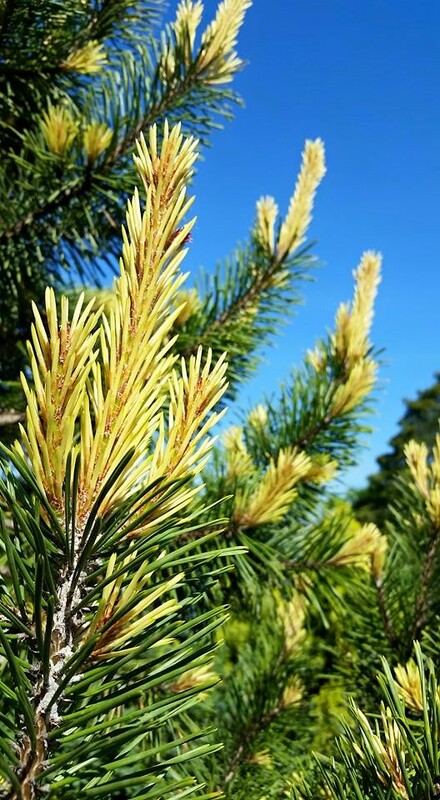 Likewise, Taylor’s Sunburst lodgepole pine (Pinus contorta ‘Taylor’s Sunburst’) is a handsome green tree for most of the year—until spring, when radiant yellow new growth bursts forth, bringing a welcome dose of sunshine to the garden. New needles aren’t the only attraction this time of year. 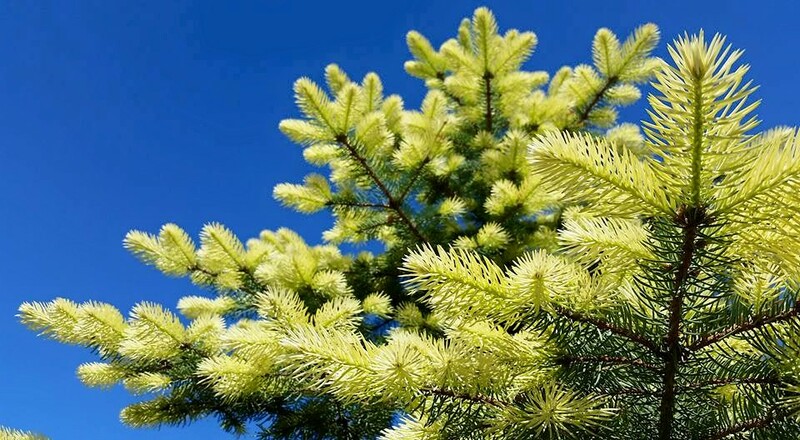 Many conifers have cones that start out in surprising shades! Blue Mound Swiss stone pine (Pinus cembra ‘Blue Mound’) would be a beautiful plant in its own right, with its long, soft, blue-green needles. But when you throw in dusky purple cones, you get a plant that is truly a gem. As the cones age, they’ll slowly turn into the more typical brown of a ripe cone, but right now, they’re as pretty as any flower. Red can be a difficult color to find in conifers, but Acrocona spruce (Picea abies ‘Acrocona’) has cones that start out a vivid ruby red and slowly fade to a soft tan. The cones start out upward-facing, but slowly begin to droop as they age. 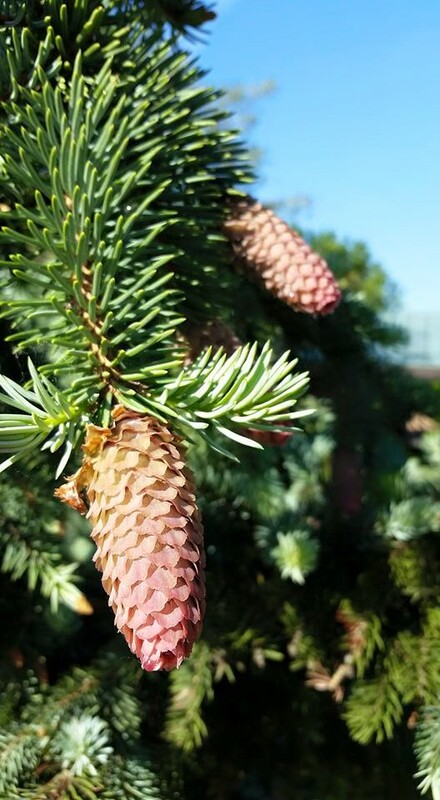 Picea abies ‘Acrocona’ has cones that start ruby red, and slowly fade to tan. Another unique plant is Silver Show dwarf Korean fir (Abies koreana ‘Silver Show’). Unlike other conifers, the firs (Abies sp.) have cones that always face upward. 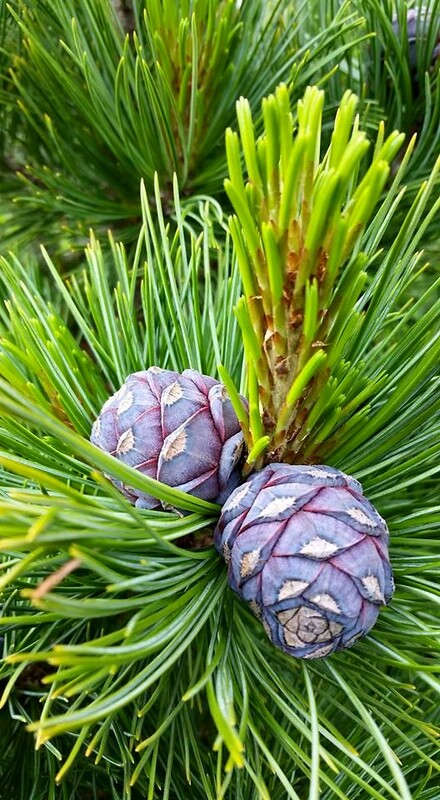 ‘Silver Show’ is beautiful any time of the year, but its purple upward-facing cones really make it special in spring. 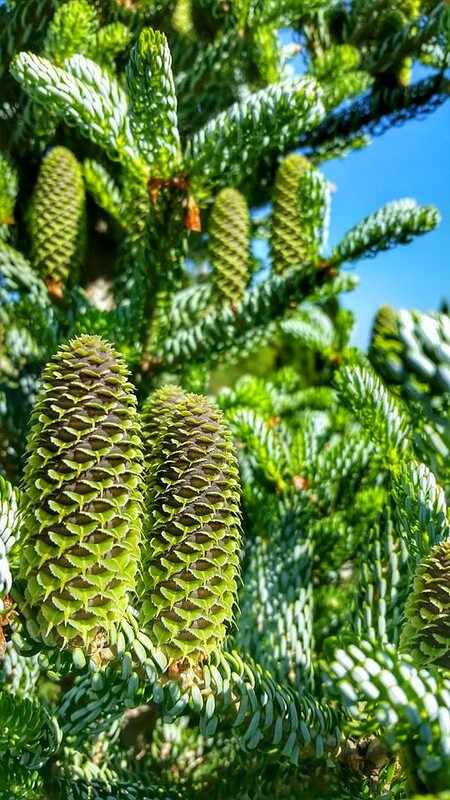 The cones start out small and green, but as you can see in this picture, they begin to turn purple as they grow until you’re left with dozens of dark purple cones set against perfectly tiered, silvery green foliage. There really is nothing else like it in the Garden. 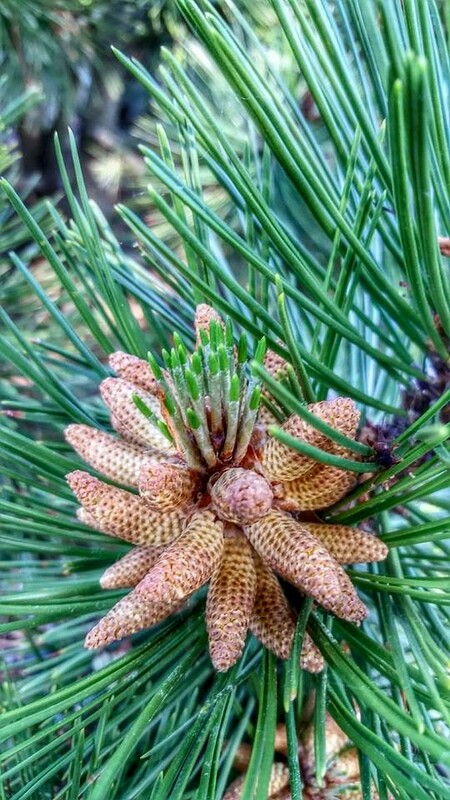 On most conifers, it’s the female cones that are most showy and most often noticed, but on Bosnian pine (Pinus leucodermis), it’s the male (pollen-bearing) cones that steal the show. Arranged in groups at the end of every branch, they light up the tree like little Christmas lights. Even on a gloomy day, the bright orangey-tan color stands out against some of the deepest green needles in the garden. All of these colors are a seasonal show that is best appreciated before things start to heat up for the summer, so now is your best time to come see them!